Marvel’s Daredevil, only on Netflix, worldwide. Via a new teaser, Netflix has announced that the second season of its Marvel’s Daredevil TV series will drop March 18, 2016, worldwide. Watch it, below. Marvel’s Daredevil stars Charlie Cox as Matt Murdock/Daredevil. The cast also includes: Jon Bernthal as Frank Castle; Elodie Yung as Elektra; Deborah Ann Woll as Karen Page; Elden Henson as Foggy Nelson; Rosario Dawson as Claire Temple; and Scott Glenn as Stick. At today’s TCA winter tour, Netflix released the second season poster (above). Variety has published publicity stills. The work is far from over. Today, Netflix announced the return of the second season of the highly-anticipated and critically-acclaimed original series Marvel’s Daredevil which will premiere on March 18, 2016 at 12:01am PT globally. The announcement was made via the show’s social pages on Twitter and Facebook. Click here to view the motion date announcement and the static image is attached. The Netflix original series Marvel’s Daredevil returns with the highly anticipated second season of its epic live-action adventure series (season 1 of Marvel’s Daredevil is now streaming). The second season debuts amidst the release of the Netflix original Marvel’s Jessica Jones, the upcoming Marvel’s Luke Cage and future release of Marvel’s Iron Fist, all leading up to the teaming of the main characters in Marvel’s The Defenders to premiere only on Netflix. The action-drama will premiere with thirteen (13) one-hour episodes. Blinded as a young boy but imbued with extraordinary senses, Matt Murdock (Charlie Cox) fights against injustice by day as a lawyer, and by night as the superhero “Daredevil” in modern day Hell’s Kitchen, New York City. 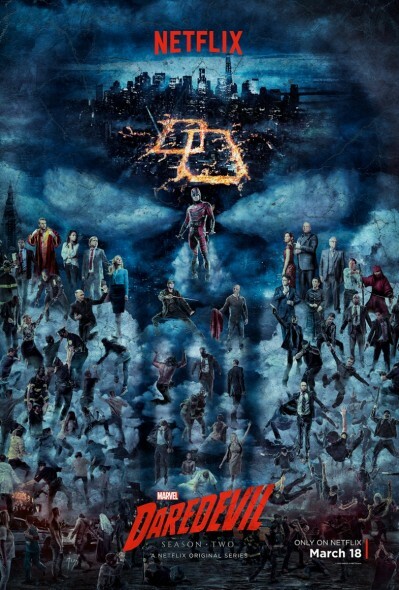 Charlie Cox (Matt Murdock/Daredevil) is joined by a stellar cast including Jon Bernthal (Frank Castle), Elodie Yung (Elektra), Deborah Ann Woll (Karen Page), Elden Henson (Foggy Nelson), Rosario Dawson (Claire Temple), and Scott Glenn (Stick). Marvel’s Daredevil is Executive Produced by series Co-Showrunners Marco Ramirez (“Sons Of Anarchy”, “Fear The Walking Dead”) and Douglas Petrie (“CSI: Crime Scene Investigation”, “Buffy: The Vampire Slayer”, “American Horror Story”), along with Jeph Loeb (“Marvel’s Jessica Jones”), who also serves as Marvel’s Head of Television. Watch the Netflix trailer for Marvel’s Daredevil, season 2. Just when Matt thinks he is bringing order back to the city, new forces are rising in Hell’s Kitchen. Now the Man Without Fear must take on a new adversary in Frank Castle and face an old flame – Elektra Natchios. Bigger problems emerge when Frank Castle, a man looking for vengeance, is reborn as The Punisher, a man who takes justice into his own hands in Matt’s neighborhood. Meanwhile, Matt must balance his duty to his community as a lawyer and his dangerous life as the Devil of Hell’s Kitchen, facing a life-altering choice that forces him to truly understand what it means to be a hero. What do you think? Did you watch the first season of Marvel’s Daredevil TV show? Do you plan to tune in for the second season? More about: Marvel's Daredevil, Marvel's Daredevil: canceled or renewed?